Typnic is a very interesting and original contemporary font family in which even the most demanding users will find what they are looking for. In fact, this extremely fresh collection can be best compared to a picnic basket where you can find all kinds of food and drinks, hence its name. But in our view it is more like a treasure chest with its fonts being real gems, diamonds and gold! What best characterizes the fonts of the Typnic family is the fact that they are handwritten and have their roots deeply embedded in the fine art of calligraphy, wood type and letterpress. Also they are very versatile as they are created with the idea to be used either separately or combined with each other. All in all, the sheer variety of looks that Typnic offers as well as the feeling of natural flow it creates makes it perfect for use in all kinds of projects and environments as it really has so much to offer. Typnic font family comes in three absolutely compatible and still very contrasting styles. 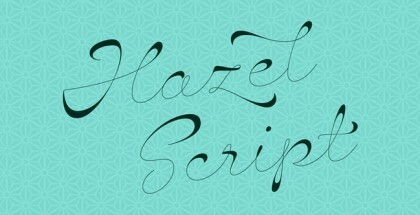 Firstly, there is the very lively Script style that comes in six versions together with a juicy ornament set. Then the Headline style – very masterfully created six layered fonts which, when used together, can account for dozens of very interesting and unique combinations. And, there comes the Roman style – your perfect tool for creating secondary texts. But that is not all, as there are special sets of very playful labels, dingbats and patterns. 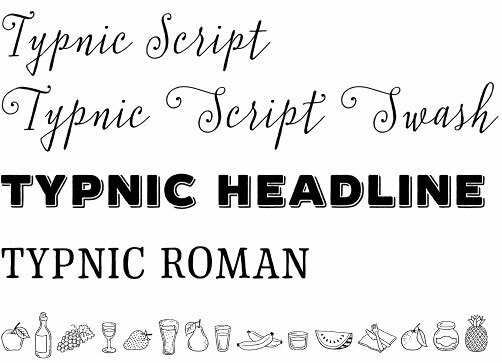 Get Typnic font family and enjoy a mix of gems!